People buy watches for a number of different reasons. Some like them as jewelry, and like to wear bling around town. Others like mechanical watches with elaborate complications. Still others like a handsome, classic timepiece that looks good in the boardroom at work. 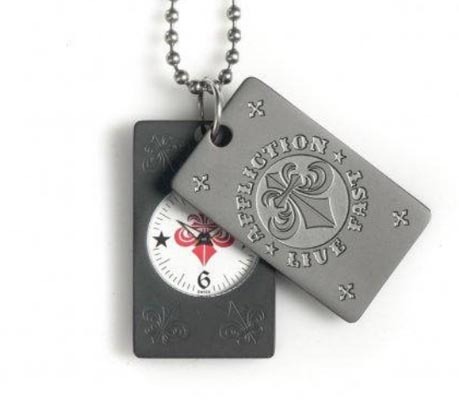 Others, such as those who buy Affliction watches, like edgy designs that stand out from the crowd. That’s what Affliction watches are all about, and that’s true of the company’s entire product line. Affliction Clothing is based in California, and the company got their start designing T-shirts. Not your standard variety T-shirts, but shirts with elaborate, complex artwork that would attract attention wherever they’re worn. The company has since become quite successful and they’ve expanded their product line to include a number of fashion accessories. Their watches fall into that category, but they’re more than just a “me too” product. They’re well-designed and well made, unlike those from other fashion brands that simply add inexpensive Chinese-made watches to their lineup so people will think they’re diverse. No, the watches are designed to be part of the company’s core product line, and they’re made to blend well with the company’s shirts. You’ll find that their watches are good quality watches that should run well for years and they won’t cost you a fortune. Read on for the full Affliction watches review. The build quality of Affliction watches is quite good, considering their price range. Cases are made from quality stainless steel, and the watch faces are protected by mineral crystal. Water resistance for most models is decent, at about 100 meters or so. You won’t find gold, platinum or titanium cases or anything with diamonds in the company’s product line, but they do have a few models with rhinestones that offer a little bit of bling. The movements found in Affliction watches come from several different manufacturers, but all of them are electronic quartz movements. Some models have Swiss-made movements from an unnamed maker (probably Rondo,) while others have Japanese-made movements sourced from Miyota, one of the largest manufacturers of watch movements in the world. Quartz movements are highly accurate and highly reliable and have the advantage of requiring relatively little maintenance. If you’re interested in a timepiece that’s largely something you can “set and forget,” this brand would be a good choice. 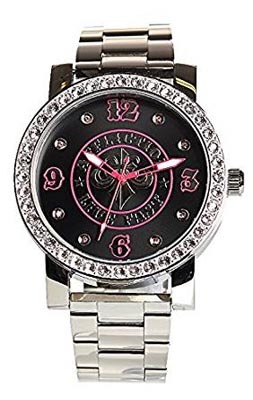 Click here to shop for Affliction watches at Amazon. You won’t find much in the way of mechanical innovation here; they’re relatively inexpensive timepieces that are more about styling than function. Affliction watches include a few chronographs and at least one model with a date complication, but if you’re looking for moon phases, perpetual calendars or power reserve indicators, you’ll have to look elsewhere. This brand is about the rugged, sometimes out-there styling, rather than the mechanics. It’s hard to describe the styling. They have a definite “biker” vibe, and a bit of an industrial look to them. They’re more the sort of watches that you’d wear for casual wear than for a corporate meeting, and colors tend towards black and silver. Many models have oversized leather bracelets, rather than a typical watch strap. Other models have a more traditional metal bracelet. Most models in the product line are somewhat oversized, in the 40-50mm range. One unusual design is the “dog tag” watch, which is designed to be worn around the neck. Styles include models for men, models for women, and unisex models. Women’s models offer a bit more color than the men’s line, and a few of the women’s models include rhinestones. They’re not overly feminine-looking watches, but there’s a certain market demographic that would likely find these models to be exactly what they’re looking for. These are bold, dramatic designs and not necessarily watches that your mother would like. 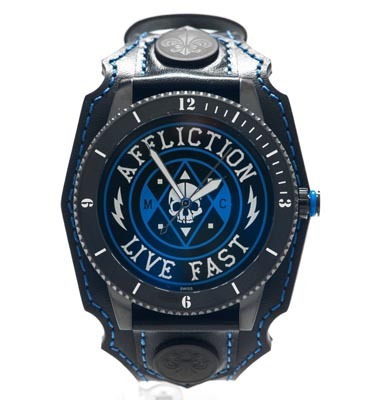 Then again, Affliction watches are the sort of timepiece you’d expect to see from a clothing company. Care and maintenance is fairly minimal. As all of the company’s watches are powered by battery-operated quartz movements, they’re not likely to require a lot of maintenance. You’ll need to have the battery replaced every few years, and you should strive to keep your watch away from strong magnetic fields or extremes of temperature, as these can affect the watch movement. Aside from those considerations, you likely won’t have any maintenance issues, and they should run well for years to come. The warranty offered is a bit less than the industry standard. 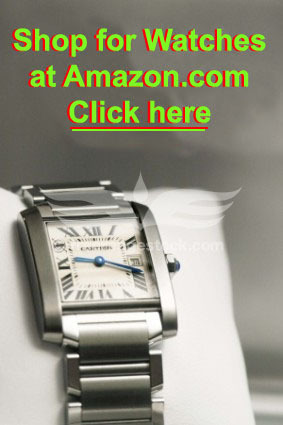 Affliction watches are warranted for one year from the date of purchase against defects in materials and craftsmanship. As these are quality watches with movements from reputable manufacturers, it’s unlikely that you’ll encounter a problem. Still, most watches sold come with a two year warranty, so in that regard, this brand falls a bit short in the warranty department. Some resellers of the brand, such as Amazon, offer a longer warranty via a third party, so you may wish to keep that in mind when you decide where to buy. If you know anything about watch prices, you’ll know that you can spend as little as $5 or as much as $5 million on a watch, and there’s a lot in the middle. Interested buyers will like the fact that these watches are priced towards the lower end of the spectrum, with most of their timepieces falling in the $100-$300 range. That makes them quite affordable, and given their good build quality, they offer a good value for your dollar. You can find them for sale at the company Website. You can also find them for sale at a number of other online retailers, such as Amazon. As far as we know, they’re not available for purchase in any department or jewelry stores, so you’ll likely have to do your shopping online. This brand isn’t for everyone. Their styling is a bit bold, not overly diverse, and, as many of their models have a “skull” motif, simply not to everyone’s taste. Still, for those who want to make a bold fashion statement or for those who just like to live outside the box, Affliction watches can make a good choice. 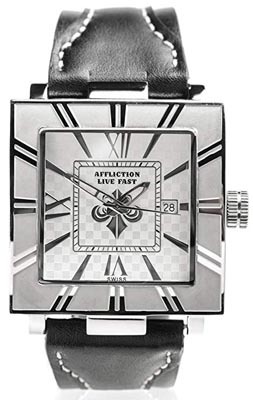 Affliction watches are well made, with Swiss and Japanese movements. They have high quality stainless steel cases, and their priced in such a way that they’re likely to be affordable for just about anyone who wants one. If you want something different that will definitely be remembered by anyone who sees it, Affliction watches might make a good choice for you.